People with acne prone skin have the most difficulty in terms of taking care of their skin. A lot of time, money and effort go into taking care of their skin. People with acne attack have to deal with a lot of issues whenever they try anything new on their skin or when they apply makeup. Any new skin care product or makeup that you try on can either work on your skin or it might just aggravate the condition of the skin. It could just accentuate the acne that you are trying to curb. The first step when you do your makeup is moisturizing of the skin. No matter what your skin type is moisturizing is very essential before you begin your makeup as the ingredients in the makeup products will dry up your skin. For acne prone skin, it is wise to choose a moisturizer that is prescribed by your dermatologist or the one which contains ingredients like benzoyl peroxide. It will not aggravate the acne. Always choose a light-weight moisturizer which is oil free, which is labelled non-comedogenic and this means it will not clog your pores. Besides that, look for ingredients like hyaluronic acid and glycerine as they hold moisture in the skin. Before you buy any new makeup products, do check the ingredients in them. See if they contain any ingredient that can make your skin worse with acne. A research on the ingredients would help to know them better. The role of a primer on an acne prone skin is very big. Primer helps in reducing the open pores and thus stops the clogging of the skin which is the main reason for acne outburst. No matter what makeup product you are choosing, make sure they are light and non-greasy products which are also hypoallergenic, oil-free, and non-comedogenic. 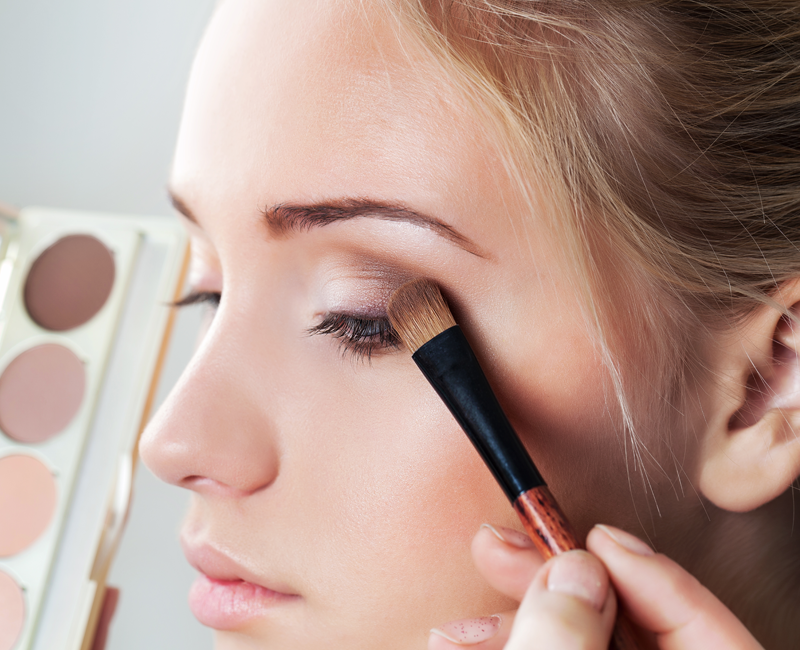 Go through the ingredients to see cosmetics contain certain ingredients like titanium dioxide, zinc oxide and silica. There is a common thought that using sunscreen triggers acne. This has never been proved so far however the fact of the matter is that in general sunscreen with high SPF tends to be very greasy and its greasiness is because of the oily ingredient that goes into the making of sunscreen. If you just settle for a 30 SPF sunscreen, it is more than enough and always opts for a gel based sunscreen. Makeup brushes and applicators have to be always cleaned properly whenever possible. The bacteria and germs easily get attracted to the brushes and then get transferred to our face. To avoid this we need to clean the brushes, sanitize and dry them before using it again. If you notice that you are getting breakouts due to certain brand of makeup product then you should try and switch to some other brand and see if that works for you. Certain brands may just not go with your skin and the others might work for you. Use makeup, only when it is absolutely required otherwise go bare- a no makeup look is also great for a change. Going bare will give your skin the chance to breath and relax. No matter what makeup you use make sure your makeup remover is as good too. You have to remove your makeup every night before you sleep otherwise the acne issue will never reduce.